EUCLES (also known as Pheidippides), an Athenian messenger, ran over 300 miles in 490 BCE - from Athens to Sparta (asking for assistance in stopping the Persian army), then to the Battle of Marathon and finally back to Athens to announce the Greek victory - all in the course of days. This Battle of Marathon is considered by many to be the pivotal moment in the preservation of Western civilization and the democratic ideal as it saved the democratically run Athens from the Persian tyrant, King Darius. And in honor of Eucles, a new race was instituted in the Olympic games...yep.. .the Marathon (42 km race). 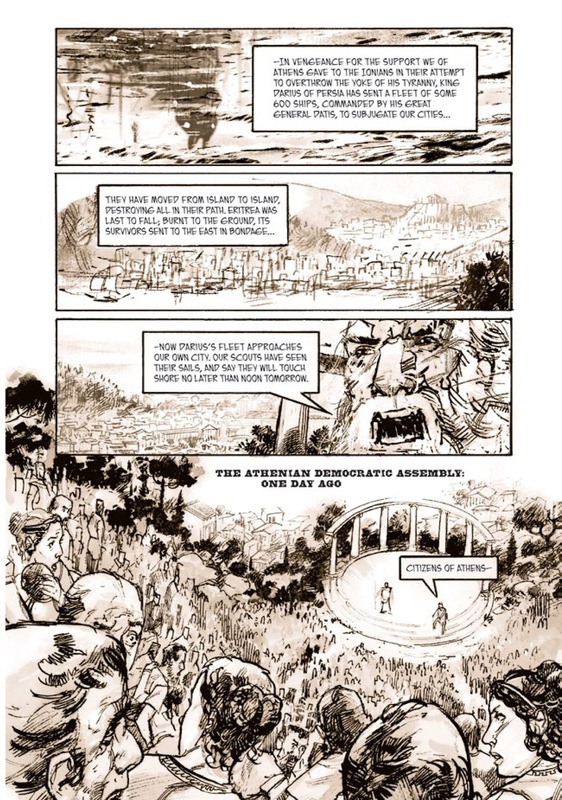 While British poet, Robert Browning wrote about Pheidippides (poem below), Boaz Yakin and Joe Infurnari tell story of Eucles and The Battle of Marathon in their graphic novel Marathon (First Second, 2012). In this new format, Eucles also proves to be a hero of Common Core Standards as this story bridges literature, and historywhile integrating verbal and visual literacy. In the beginning of Marathon - through use of color and and black and white - we see Eucles running to Sparta while reflecting on his life and setting the stage for the world's first marathon and an epic battle of democratic Athens fighting a Persian tyrant monarch. This gripping story told through prose, metaphor and illustrations retells history and clearly illustrates military strategy for teens through adults and can and should be used in language arts and history classes from Gr. 7+. While the text in this first image is not sharp enough to read (my apologies) you can see how the authors use color and black and white panel placement to flashback to the past while simultaneously focusing on the present. This use of brown-shaded vs. black and white panels provides a wonderful lesson for visual literacy. Joe Infurnari brilliantly uses black and white images to recount Eucles' past as he runs towards his destiny in color. Furthermore, Infurnari uses only one color - antique brown - to add the feeling of 'history.' Finally, panel design and placement also plays a role. As you can see in this first image (and throughout the book) some panels have borders 'containing' the story and other panels have no constraining edges or borders empowering the story to 'overflow' freely while 'narrating' the story. LESSON SUGGESTION: Discussing the use of color, panel design, and page organization provides a motivating lesson on non-verbal communication. 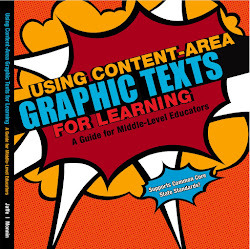 You may also want to compare other graphic texts and graphic novels - critically evaluating other author/illustrators' use of color, panel and page usage to tell a story. A class project may be to break the class into a number of groups. Each group must visually retell the same story (any story): one group tell it in black and white, another in one color (and you may want a number of groups - each depicting the story in only one - different - color), and a final group using a variety of colors. Then have the class analyze each group's story based on the color and panels of their stories. How does the use of color influence the story? While Yakim and Infurnary tell this story from two different perspectives, both focus on Greek vs. Persian strategies of war and battle, while allowing each major character's wits and will to be displayed and evaluated by the reader/observer. LESSON SUGGESTION: Compare and contrast the story and the major characters in Marathon as told by verse vs. that told by the illustrations. -One was my dearest friend. The other a little tick who called for my father's blood. The gods have laid a feast both bitter and sweet before me. In this exchange, not only is the choice of words interesting, but the use of metaphor and literary devices is rife for discussion. LESSON SUGGESTIONS: Discuss the author's choice of words to help give the story a more archaic, ancient 'feel'. Doe is work? Why or why not. See, ’tis myself here standing alive, no spectre that speaks! “Run, Pheidippides, run and race, reach Sparta for aid! Into their midst I broke: breath served but for “Persia has come! Answer me quick, what help, what hand do you stretch o’er destruction’s brink? “Persia has come, Athens asks aid, and still they debate? “Has Persia come, does Athens ask aid, may Sparta befriend? Count we no time lost time which lags thro’ respect to the Gods! “Have ye kept faith, proved mindful of honours we paid you erewhile? “Where I could enter, there I depart by! Night in the fosse? Better!” when, ha! what was it I came on, of wonders that are? “How is it, Athens, only in Hellas, holds me aloof? “Athens, she only, rears me no fane, makes me no feast! Here am I back. Praise Pan, we stand no more on the razor’s edge! “I am bold to believe, Pan means reward the most to my mind! Is still “Rejoice!” his word which brought rejoicing indeed. “Athens is saved!” Pheidippides dies in the shout for his meed. evaluating perspectives of different cultures. 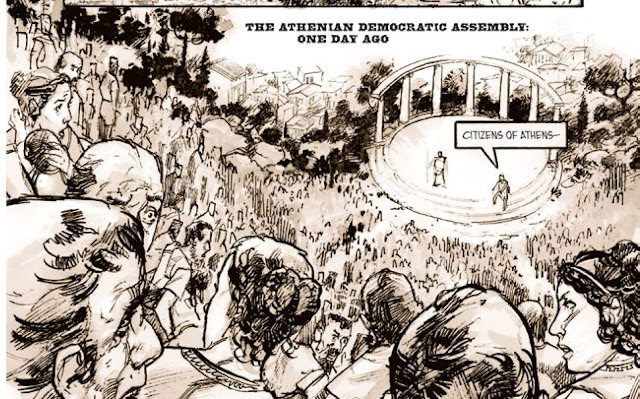 DEMOCRACY: On the bottom of page 17, Mr. Infurnari depicts "The Athenian Democratic Assembly"
Analyze the picture - who is speaking, who is participating/listening, are those speaking 'elected' officials or can anyone get up and speak, are 'the people' engaged in the conversation, how long might they be sitting and 'discussing'? 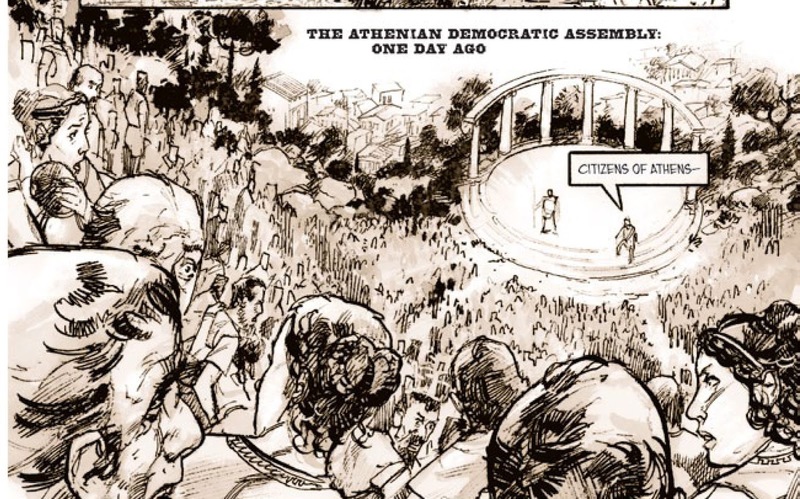 Research how assemblies worked and how the Athenian Democratic Assembly differs from our Congress today. Get a map of Ancient Greece and discuss the 'trip' from Persia to Athens, the terrain at Marathon, as well as the topography of the land from Athens to Sparta. Discuss how the Persians' voyage may have impacted their performance. Discuss how the topography may have impacted the battle and Eucles' run. Divide the class into Athenians and Persians or simply make a chart and compare military strategies as well as weapons used - discussing the merits and deficits they each present. Yakin and Infurnari spent a great deal of time developing and discussing this. In fact, the Athenians were successful because they used a 'new' strategy of running quickly into the foray of arrows and as a result not one arrow found its mark. The military strategies are both fascinating and motivating for discussion, research, and analysis and many are still used today. Analyze the illustration - ask them how it was propelled and who propelled it, how long might it have taken to construct, how might it have been maintained, what 'image' does the design relay and how might opposing armies reacted when seeing these vessels. Research the accuracy of this illustration- how does it compare to ships of different eras. These are just a few ideas and comments. I loved reading this book and recommend it highly for teens and adults - especially in light of the 2012 Summer Olympics. History and language arts can and should be fun and this is one way of motivating students while incorporating the past and present in meaningful ways. Thanks for your visit.I'd love to hear your thoughts on this post in the comments, and hope to see you back next week. We did Ancient Greece (grade level 3 - 5) last winter, but has it has held on via the Percy Jackson books! This will be an alluring segue into more complicated/dramatic events for my (now) 4th and 6th grade home schoolers. They adore graphic novels, and I appreciate your blog for being my guide. Wonderful lesson plan! And wonderful to share the poem. I love how in Greek stories the mythology of the event blends with the historical events so seamlessly, such as Pan's involvement with the Persian troops. You see this also in the Iliad. You've taken the topic and really run with it! Meryl, you always amaze me with the work and effort you put into your posts. I think I must have been under a rock during my school years. I certainly don't remember most of what you post. Frankly, I wish you had been my teacher! Am completely getting this for my mythology and ancient worlds obsessed son! What a wonderful post! Very interesting post! I don't remember much about mythology from my school days, but have always wanted to read up a little more on the subject. I like the illustrations from the book, and will have to make a note to see if my library has this book or something similar in stock soon. There are some awesome iPad Apps that would help with that assignment as well. Great homeschool lesson! I will have to print this one up. I tried running for about a month and just couldn't stand it. I'm quite impressed (and a little jealous) of all people that actually enjoy racing. Fascinating. 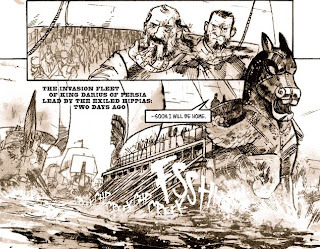 I know that my husband would love to be able to teach concepts using graphic novels. I like how you've made it a full experience, bringing in the visual imagery and the "how" of the graphic medium as part of the lesson. I feel like this is 'enrichment' that encourages critical reading as well as exploring history. This is what real education looks like! So that's Eucles for Marathon. Visuals are indeed a great help in understanding vocabulary. Guess they explain as much as dictionary data. Hi Meryl! I sometimes think that I am a lazy person, and also not intelligent enough to read a post that is longer than three or four paragraphs, but thank you for all the trouble you took to write this post. You are a great teacher. The marathon has a very interesting history. Thanks for sharing! I am not good with History, my least favorite subject in school.